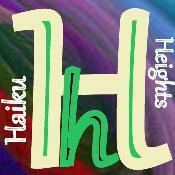 Today's prompt for Haiku Heights April challenge 2012 is Temptation. When we feel doing something is wrong, but mind can't resist the temptation, mind find excuses just like above. Temptation to do what.. that's the crux.. Mohiniji, I am so happy to find your comment on my poem.. I have always maintained.. if there is pain in my heart...it doesn't mean I am not happy..I have a poem written on it... pain in one form or the other have always stayed.. I think root of poetry is pain...that's what I think...about 30 months ago I didn't know I had so much to share with the world...more than 550 posts... search for "Hadn't he become a tear" on my blog and then tell me waht do you think....I have invited a number of discerning minds to read that poem which just flowed.. my thanks to you...for nice words..
Love the question. We all ask it at times. Well done haiku. Oh, no, temptation must be good sometimes. besides, it's so much fun. That's the question! In my opinion not everything is temptation.